This (see the pictures! 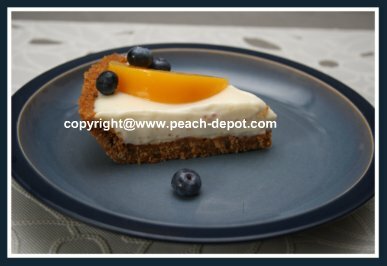 ), Peach Dessert with Graham Crackers Crumb Crust is the easiest peach pie dessert ever! I made this pie, and it turned out fabulous, and scrumptious! If you don't have peaches on hand, use ANY fresh or canned (drained) fruit as a topping - be creative! This recipe is a keeper! ... Be sure to add it to your favourites! Note - You can use a purchased graham cracker crumb crust, or make your own. Making your own makes a nicer, thicker crust! Use the following link to the recipe I always use for a great crumb crust. Using an electric mixer on "low" speed, combine the condensed milk, the sour cream, and the lime juice, and mix till smooth, about 3 minutes. Spoon the mixture into an 8" or 9" graham cracker crumb crust. ~ Top with peach slices, and/or any other fruit. 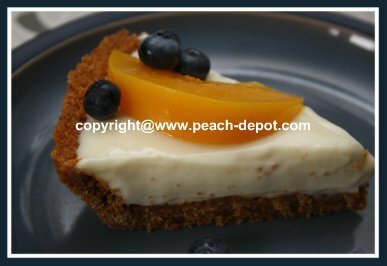 ~ Tip - I like to first cut the pie into servings, remove it from the pie dish, and then, after the pie slices are on the individual serving plates, add the fruit. 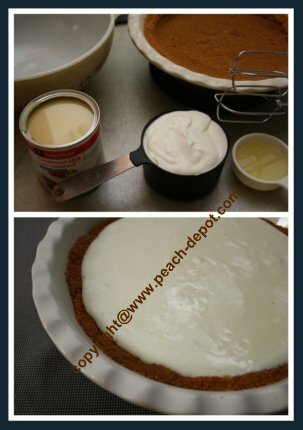 This makes the presentation of the pie much neater (no fruit "falling" off, and every slice of pie can be offered with about the same amount of fruit). Try adding fresh blueberries, strawberries, raspberries! DELICIOUS AND VERY QUICK AND EASY! Anyone can make this Peach Dessert, you don't have to have a lot of experience with baking!